Improvisation is key | Loch Lomond Livestock Ltd. Sometimes you have to make do with what you’ve got. Normally, if I have a sheep that for any reason needs to be brought from the pasture to the yard, I will catch said sheep, put her in my “ewe haul”, which i pull behind the side by side, and bring her in. But, both my side by side and the ewe haul are in need of repairs, so I am using the old truck (or the old quad). So when I had a ewe that needed to be brought in because she was sick, I had to improvise. First I thought I would put her in the back of the truck, but soon decided I couldn’t get her up there on my own, so into the front she came. 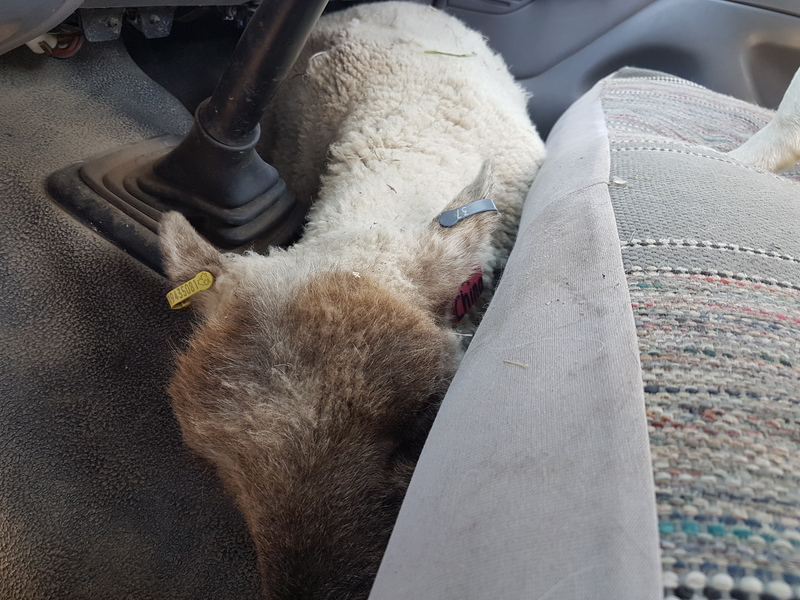 It was a short and uneventful ride back and she was soon settled in the yard, neither her or the truck any worse for wear.